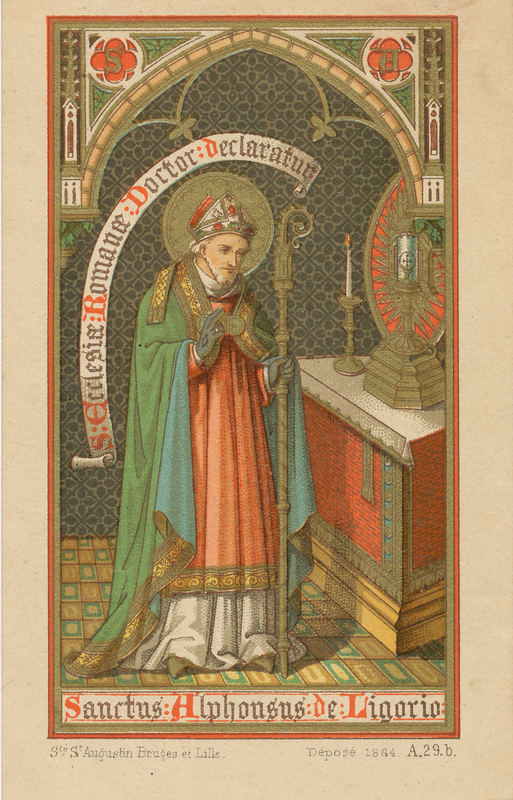 So crippled with arthritis that he could not lift his head off of his chest, St. Alphonsus Liguori looked on his illness as a grace since it made him use his earthly time in the most productive manner possible. In chronic pain and expecting to die at any moment, he went on to publish over 60 books dealing with theological studies, as well as music and poetry. He is invoked by those suffering with arthritis for a cure as well as those seeking a way to live a productive life while stricken with illness. Born into a noble but poor family near Naples in 1696, Alphonsus Liguori was the eldest of seven children. Though he was physically small with poor eyesight, he was incredibly intelligent and musically talented. Because of his poor eyesight he could not follow in his father’s military footsteps, but his intellectual brilliance made him the hope of his family, as he received his law degree at the early age of sixteen. He quickly became famous in the Neapolitan courts for never losing a case. A devout Catholic, he credited his success with his daily mass going. After eight years of constant triumph, Alphonsus was stunned to lose an extremely important and public case due to his own oversight regarding a signed document. Humiliated, he looked on this personal disaster as sign from God and fasted and prayed for three days. While doing charitable work in the Hospital for the Incurables, he had a vision commanding him to quit the world and give himself to God. His father was outraged when left the law for the priesthood. Devoting his work to those on the outskirts of society, he founded the Redemptorist Fathers, an order devoted to doing missionary work among the poor. Though gifted with the ability to argue the most finite facts of law or theology Alphonsus Liguori always preached in the simplest terms, writing many books and pamphlets in the vernacular of the common person. Because of his great popularity as a preacher, his religious order began to attract many young people. Living at a time of great political and religious upheaval and plagued with deteriorating health, Alphonsus Liguori never enjoyed much peace in his life. Instead, he welcomed these obstacles as an opportunity to perfect his soul. Banner: declaring him Doctor of the Church because of the incredible range and amount of his writings. Bishop hat and staff: he was a Bishop and leader of his order. Crucifix: Total devotion to Christ and His teachings. Glorius Saint Alphonsus, loving fathr of the poor and sick, all your life you devoted yourself with a charity really heroic to lightening their spiritual and bodily miseries. Full of confidence in your tender pity for the sick, since you yourself have patiently borne the cross of illness, I come to you for help in my present need. Loving father of the suffering, Saint Alphonsus, whom I invoke as the Arthritic Saint, since you suffered from the disease in your lifetime, look with compassion upon me in my suffering. Beg God to give me good health. If it is not God’s will to cure me, then give me strength to bear my cross patiently and to offer my sufferings in union with my crucified Savior and His Mother of Sorrows, for the glory of God and the salvation of souls, in reparation for my sins and those of others, for the needs of this troubled world, and for the souls in purgatory. Please see novena app on iTunes if you want your novena’s wherever you go. This entry was posted in Novena and tagged help, Novena, prayer, saint by sandra dipasqua. Bookmark the permalink.